Imagine the perfect Sunday. The weather is sunny but not hot. There’s a warm breeze and just enough clouds for the occasional shade. Your friends and family are over, and you’re grilling dinner for everyone. No need to go inside for any ingredients or equipment. Everything you need is right within your reach. Once everything is ready, you can walk a few feet to the dining table while watching some football on the outdoor TV or play some relaxing tunes through your outdoor speaker system. Sounds like a pretty perfect scenario, doesn’t it? Well, you can make this dream a reality with an outdoor kitchen from Fallas Landscape! What kitchen amenities and appliances can I get? With Fallas Landscape, the possibilities for your outdoor kitchen are only limited by your budget and imagination. Built in grills with plenty of counter space and storage are typical features, but there are plenty of additional options. Some of the options you can add-on are sinks, refrigerators, bars, food warmers, smokers, vent hoods, even a pizza oven. Of course, you’ll need an outdoor dining table for you and your guests. You can even have an outdoor TV and sound system. This isn’t an exhaustive list by any means, but it can give you a good idea of what your outdoor kitchen would look like. We will work with you to build the custom outdoor kitchen of your dreams. The cost of an outdoor kitchen depends entirely on your wants and needs. If you want a small setup it will obviously cost less than building a brand new set-up with a comprehensive outdoor kitchen and dining room. Since we specialize in building unique, custom kitchens for our customers, it’s hard to pin down what an exact price would be without knowing what you want. Luckily, we offer free estimates, so give us a call! We’ll get you an estimate as soon as possible. 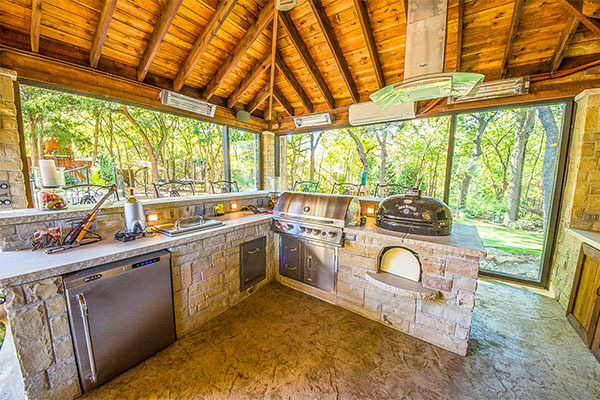 If you’ve been dreaming about an outdoor kitchen, why wait any longer? We will work closely with you to create a kitchen that will meet your wants while remaining budget-friendly. Our customer service is second to none, and we’ll make sure you’re more than happy with the finished product. We also build outdoor living spaces, pools, aquatic features, patios, and fences, and we offer landscape design and lawn services. Let us make your yard a beautiful place to be. Contact Fallas Landscape today for your free estimate!